I returned to Ohio from a too short trip to Pennsylvania. So many new memories to savor. Just one day to rest and repack for another trip to Lake Michigan with my granddaughter, Arianna. She is a senior at Kent State this coming Fall; this will most likely be our last extended visit with each other. 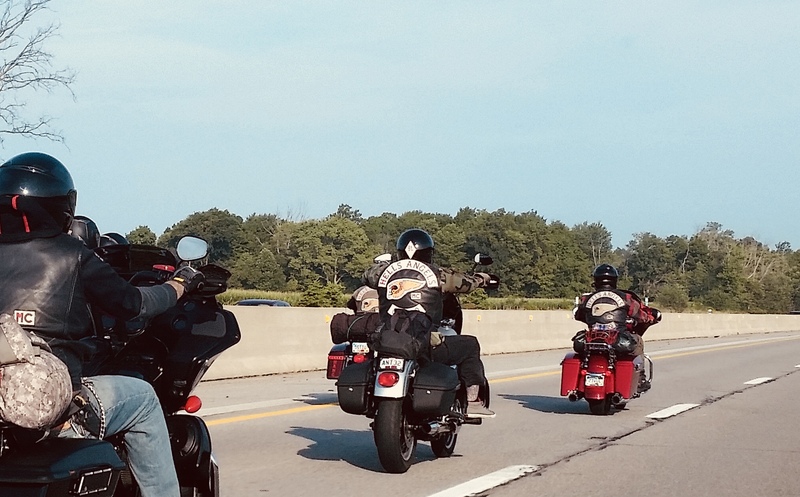 On the way to our lakeshore adventure, we rode for several miles alongside a group from the famous (or is it infamous?) Hell’s Angels motorcycle club. We found ourselves woven into the tapestry of Americana. Born under a wand'rin' star.... living in my Winnebago, traveling the country, explorer/adventurer, photographer, writer, chi master, massage therapist, retired teacher/counselor, work camper. Appreciation for the freedom to do it all. Enjoying life's ultimate lessons of trust, respect, and grace. This entry was posted in Uncategorized and tagged AMERICANA, ANGELS, HOME ON THE ROAD, Road Trips, tincantravelerPhotos. Bookmark the permalink. Wow, great adventures where ever you go. Pretty cool Missing you. I see my path but I do not know where it leads. Not knowing where I am going is what inspires me to travel it. Only those who risk going too far will ever know how far to go. ©Copyright All text, photographs and images are my original work unless otherwise noted. All rights reserved.